By springtime your racecar should be in top shape, but are you? 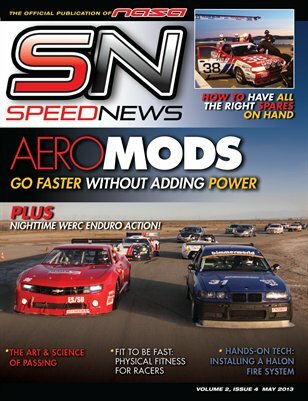 In the May issue of Speed News, we present a primer on racing driver fitness, with exercises designed specifically for racers, as well as tips for eating right on and before race day. We’ll also detail the ins and outs of aerodynamic devices and what they do on a racecar. We highlight the art and science of passing and do a step-by-step installation of a halon fire system.